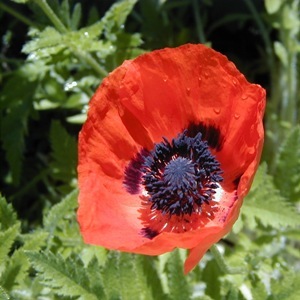 The Oriental poppy is simultaneously delicate and dramatic, architectural and ephemeral. They are easily grown in well drained soil, but can suffer from mildew if too dry or too wet. In border soil they should thrive and give a spectacular, if brief, display in mid-summer. They do not come true from seed, so any named cultivars should be deadheaded and propagated by division or root cuttings. Alternatively you could let them self seed and you might end up with a fantastic and unique addition to your herbaceous border.